Mirroring the strong gusts and chilly rain that greeted audiences at the 2006 Toronto Film Festival (TIFF), the winds of change blowing through the nonfiction programming were equally robust (and decidedly warmer). The festival's Real to Reel programmer Sean Farnel moved on to Hot Docs and was succeeded by author/filmmaker/teacher/programmer Thom Powers, who introduced a slew of new initiatives, large and small, designed to shine the spotlight on TIFF's documentary films. Powers' 2006 additions included a doc blog, early morning breakfasts with film talent, networking roundtables that paired Canadian filmmakers with industry executives through a partnership with Documentary Organization of Canada (DOC), a dedicated documentary hang-out called "Doc Corner" and a series of Doc Talks that used the subject matter of various films as the jumping-off point for wider discussions. "There's a real opportunity for documentaries here because you have the attention of the whole world's press," explains Powers. "You've got 260 feature films, the huge press engines of major studios that are launching Oscar-winning films and the presence of hundreds of giant movie stars. For documentaries to compete in this atmosphere, you need to do things to stand out in that crowd. That was the underlying goal of these initiatives." Powers' slate reflected a wide variety of nonfiction fare, from gorgeously shot epics to gritty, vérité portraits. As in previous years, there was an abundance of music-oriented films, including David Leaf and John Scheinfeld's The U.S. vs. John Lennon, AJ Schnack's Kurt Cobain About a Son and Jerome Laperrousaz's look at Jamaican music in Made in Jamaica. Dixie Chicks: Shut Up and Sing was an enjoyable surprise. Co-directors Barbara Kopple and Cecilia Peck have created a powerful, engaging and often funny piece about three friends, musicians and mothers who unexpectedly become the poster children for speaking out against the invasion of Iraq. Kopple and Peck have known each other for ten years and worked together in a variety of capacities, though this is their first time co-directing. Over a laughter-filled breakfast, they candidly spoke of their mutual admiration for one another. The bond between the filmmakers echoes the connection seen on screen among their subjects, making it clear why the Dixie Chicks trusted the duo to tell their story. Said Kopple, "I think the Dixie Chicks are just lucky enough to have that deep bond of friendship and sisterhood, and I think it makes us all look at our friends who are that dear and ask, ‘Are we that lucky?' I would like to model the relationships that I have after their kind of creative friendships. That was one of the marvelous things about being included in this project." One of the joys of going to a festival is the opportunity to experience documentaries on the big screen that utilize a vibrant sense of visual storytelling. Blindsight, Lucy Walker's (Devil's Playground) touching chronicle of an expedition of blind Tibetan teenagers who set out to climb the 23,000-foot Lhakpa Ri on the north side of Mount Everest, features beautiful, snowy vistas and daring cinematography. As the courageous teens battle the mountain, the scale of the physical and emotional journey they take is more easily appreciated when viewed in a theatrical setting. Much more than just a nature documentary, the film poignantly explores the dynamic of the needs of the group versus those of the individual. The expedition was led by renowned climber Erik Weihenmayer, the only blind man to have scaled Everest, and blind educator Sabriye Tenberken, founder of Braille Without Borders, the first and only school for the blind in Tibet. Another visual treat at TIFF was Jennifer Baichwal's Manufactured Landscapes, which played in the Special Presentations section. The film is a portrait of photographer Edward Burtynsky, the celebrated Canadian photographer who specializes in large-scale studies of industrial vistas. 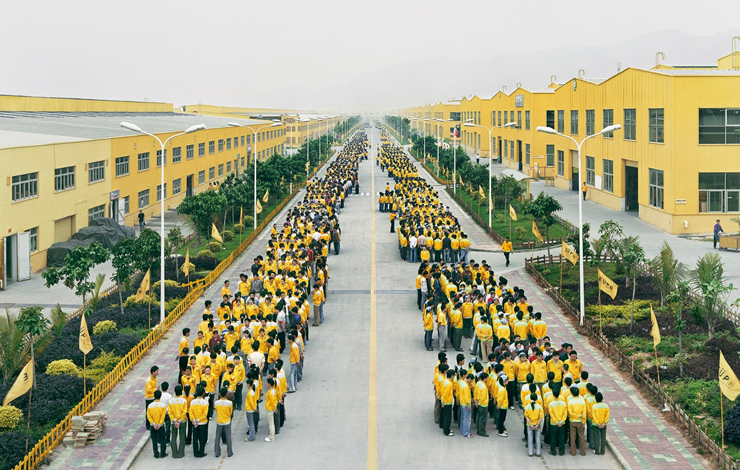 Baichwal and his collaborator, cinematographer Peter Mettler--who was honored with a retrospective at this year's festival, use Burtynsky's process as a starting point to explore the effects of globalization and industrialization on the natural world. Manufactured Landscapes begins with an amazing eight-minute shot of a Chinese factory that Burtynsky is photographing, and includes fantastic, disturbing footage of toxic ship yards in Bangladesh where oil tankers go to die. The film is actually a perfect complement to An Inconvenient Truth, in which Al Gore talks about what mankind is doing to the Earth; Manufactured Landscapes actually takes the viewers to the places being destroyed. On the opposite end of the spectrum were smaller films told from the point of view of their subjects. Two such docs challenge our notion of the meaning of the term "terrorist," replacing a stereotype with a human story. Michael Tucker and Petra Epperlein's The Prisoner or: How I Planned to Kill Tony Blair is an account of Iraqi journalist Yunis Khatayer Abbas, who was tortured by Uday Hussein in 1998 and then interrogated by US forces at Abu Ghraib and other facilities for nine months after he was captured in September 2003. Abbas tells his story simply and directly, aided by Epperlein's comic-book style drawings, recently declassified documents and his own home movies. His desires are simple: to have peace in his homeland, to be a journalist and to "tell the truth." The film had the remarkable power to do what so many news reports have not been able to do--show us the commonalities we have with our supposed enemies. In De Terrorist Hans-Joachim Klein (My Life as a Terrorist: The Story of Hans-Joachim Klein) by Alexander Oey, Klein recounts his experiences as part of the German left in the mid-1970s. He was part of the group that took 70 OPEC ministers hostage in 1975 in Vienna. Wounded during the event, he escaped to Algiers. Eventually he turned his back on terrorism, hiding out from both the police and former allies until he surrendered to authorities in 1998. As he road-trips through Germany, Italy and France, Klein recounts his history, taking the audience on his figurative journey from idealistic student to violent terrorist to remorseful adult. If not familiar with the fringe groups from that time period, such as the Red Army Faction (RAF) and the Revolutionary Cells (RZ), one might have some confusion in processing the details of the history. On the other hand, Klein's emotional journey, punctuated by violent archival footage intercut with shots of himself older and peacefully gardening, is quite clear. Tahani Rached's These Girls (El-Banate Dol) and Camila Guzmán Urzúa's The Sugar Curtain (El Telón de Azúcar) each provide rare glimpses into worlds not often accessible to Americans. These Girls is a gritty, fly-on-the-wall documentary about the street walkers of Cairo. Filled with vibrant personalities alternately tough and tender, the film captures the energy, violence and hopelessness of these girls' lives as they sell themselves, take pills and revel in their youth. The Sugar Curtain looks at growing up in Cuba when Communism held the golden promise of a safe, secure future. Urzúa frames her piece with the story of the "Pioneers for Communism," a sort of Communist summer camp, complete with food fights and arts and crafts. The film provides a glimpse of a version of the country outsiders rarely hear about: the Cuba where Fidel Castro pushed for an end to illiteracy, where work was plentiful, where everyone had healthcare and where faith in Socialism and Communism was absolute. This makes it all the more poignant when Urzúa visits with former Pioneers and they express how their lives and idealistic views changed over the years as the country broke down after the fall of the USSR. All too soon, the festival wrapped, the sun finally came out again and attendees found there were films they did not have a chance to see. But that is why the Toronto International Film Festival remains North America's premiere fall event, introducing the films that documentary fans will be talking about all year long. Tamara Krinsky is associate editor of Documentary magazine and covers events for iklipz.com.